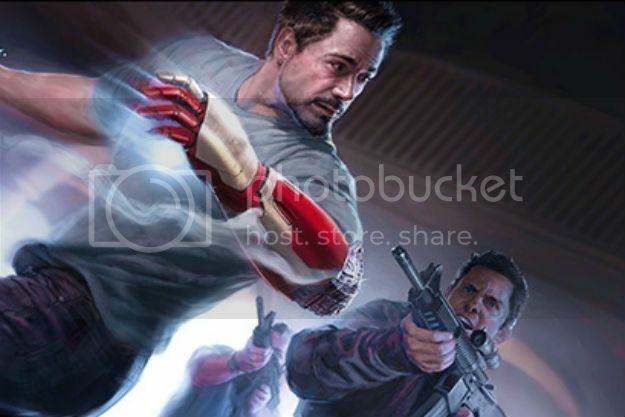 Panel attendees will get a limited-edition poster gift showing part of that “ever-expanding Marvel Cinematic Universe:” artwork by concept artist Ryan Meinerding and depicting Iron Man / Tony Stark / Robert Downey, Jr., in what appears to be a half-him, half-Iron Man phase and surrounded by men with automatic weapons of some kind. What this indicates is really anyone’s best guess, and many have been flying around the Internet. Entertainment Weekly calls it Stark’s “awkward moment” (a term I’m getting tired of seeing on blogs and microblogs) and speculates that its the new Mark VII suit working to attach itself to Stark, much as it did in The Avengers. They also refer to what is was the Extremis comic book series made between 2005 and 2006, and that formed much of the story for the first Iron Man movie in 2008. The basic concept of the Extremis storyline has Tony Stark battling members of a domestic militia group who have managed to illegally obtain use of a new kind of “robotic microsurgery” that is a military nanotechnology serum created to rebuild the body of the person who’s the subject from scratch, and super-human capabilities can be pre-programmed into the process before it starts. This happens to one of the domestic militia group members called Mellen, and Stark, fighting for his life after a battle with Mellen, is forced to use it for himself. The result is a new Iron Man – one basically fused into Stark’s body and in such a way that the internal control system that was in his helmet is now part of him and Stark can tap into any satellite network around the World. Stark also has a new suitcased-sized Iron Man suit that attaches itself to him when he thinks about it. Later, Mandarin attempts to release Extremis as part of a crazy plan to “reshape” the human race. It’s possible Iron Man 3 is based on this story, but with some alterations; it’s widely noted that Stark goes to China to face Mandarin in Iron Man 3. We’ll learn more at Comic Con 2012. Be the first to comment on "Comic Con 2012: Iron Man 3 And Art Poster; Walt Disney Studios"